Ralphie from the Christmas classic A Christmas Story as a vinyl figure! Stands 3 3/4-inches tall. Check out Ralphie in his pink bunny pajamas from Aunt Clara! Peter Billingsley's Ralphie from the Christmas classic A Christmas Story has been given the Pop! 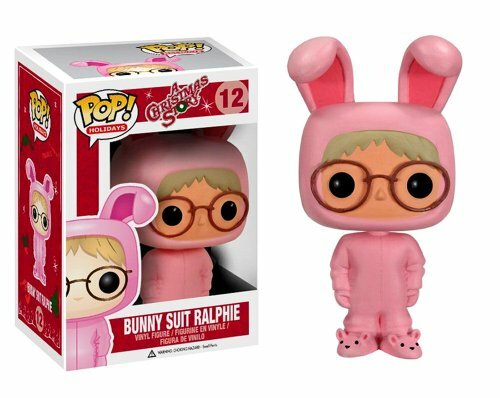 Vinyl treatment with this A Christmas Story Pink Bunny Ralphie Pop! Vinyl Figure! Ralphie looks great in those pink bunny PJs his Aunt Clara got him for Christmas, even if he doesn't think so. Standing 3 3/4-inches tall, the A Christmas Story Pink Bunny Ralphie Pop! Vinyl Figure makes for a great display piece or conversation starter on your desk at work! Ages 5 and up.